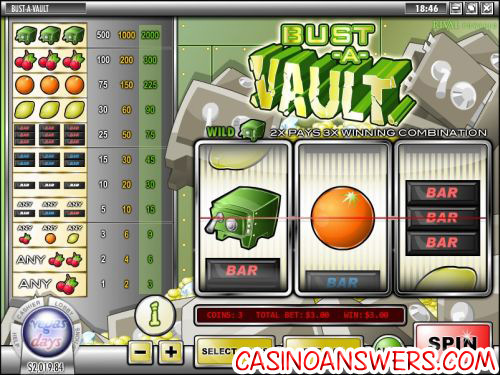 Bust-A-Vault Classic Slot Guide & Review - Casino Answers! Bust-A-Vault is a classic 3-reel, 1-line slot machine with wild symbols from Rival Gaming. You can play Bust-A-Vault at any Rival-powered casino, including Bovada. Most of the symbols in Bust-A-Vault are standard slot machine symbols. They include cherries, oranges, lemons and bar symbols. You can find the complete paytable at the left side of the screen. The top symbol is exclusive to Bust-A-Vault – the vault! Hit 3 vaults and you will win the top jackpot of 2000X. The vault also acts as a wild symbol and multiplier. Hit two vaults to complete a winning combination and you will triple your win. You can get this win by playing at Bovada. To play Bust-A-Vault, first select your coin value. The choices you have here are $0.01, $0.05, $0.10, $0.25, $0.50, $1, $2 and $5. Then, you can select the number of coins by using the “Select Coins” button. Casino Answers advises to simply use the “Bet Max” button and play all three coins at your selected coin value. Bust-A-Vault is a fun little classic slot machine, great for casual players. There’s not a lot to it, but there doesn’t need to be. To play Bust-A-Vault, please visit a Rival-powered online casino such as Bovada. Can US players play Bust-A-Vault? Unfortunately, American players are no longer permitted to play at Rival online casinos for real money. Instead, we invite you to play at Slotland Casino. Does the Bust-A-Vault slot machine have a progressive jackpot? No, Bust-A-Vault does not have a progressive jackpot. You can find several of other slot machines that do have progressive jackpots over at Vegas Days Casino. These progressive jackpot slots include Money Magic, Major Moolah, Strike Gold and One Million Reels BC. What is the top jackpot on Bust-A-Vault? If you hit three vaults on a 3-coin bet in Bust-A-Vault, you will win 2000X your bet. Make sure to bet all three coins on all of your spins to make sure you don’t miss out on hitting the jackpot. Are there any vault busting slot machines? Is there any break the bank slot machines? What is a good slot machine bonus game?